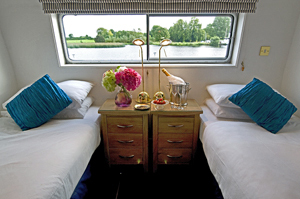 SHANNON PRINCESS, a 10 passenger deluxe barge, cruises through unspoiled Irish countryside through a series of lakes connected by rivers and canals. The carefully designed barge includes a comfortable salon and dining area with a full length upper sundeck. The cabins of 130 sq. 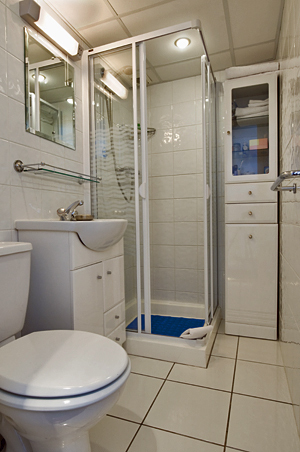 feet offer twin or queen beds and ensuite newly tiled bathrooms with large shower. The experienced Captain, crew and Master Chef provide you with all your needs as you relax and enjoy the warm and lively Irish lifestyle. All barge amenities including sundeck, music system, library, etc. 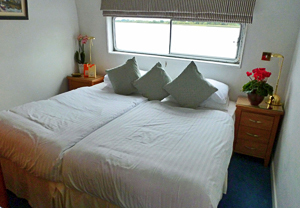 Guests are met at the **designated meeting point and transferred to the Shannon Princess moored in historic Killaloe, which is situated in County Clare on the Shannon’s West Bank and named after a monastery founded by St. Lua in the sixth century. Time for a stroll around the picturesque town of Killaloe. St. Flannan’s Cathedral is worth a visit. It was built in the 13th century to replace the first Cathedral destroyed by Donal Mor O’Brien, King of Munster and a descendant of Brian Boru. It has many artefacts predating the 13th century including an ancient Ogham stone. Dinner on board. Today we begin our cruise, moving through from the fjord like reaches of the Shannon into lovely Lough Derg. Enroute past Holy Island, Deer Rock and Derry Castle, we move onto the widest point of the lake and ease westward towards to our mooring at Mountshannon. After lunch depart by bus for a visit to the Craggaunowen Project, which is a Celtic Bronze Age settlement or “Crannog” reconstructed. Later in the afternoon we visit a traditional Irish hand weavers workshop, where guests will experience a step back in time, while learning how these thriving small cottage industries are dealing with technology and the future. Option to go to the Cliffs of Moher today. Dinner on board. During a leisurely cruise north through a wide variety of lake and shoreline scenery we pass the island of Illamore and ease towards the Eastern Shore. Arrive in Terryglass, a beautiful tiny picturesque village a few hundred yards from the harbour. The village has twice won the highly coveted national prize of Ireland's Tidiest Town. After lunch we visit "Leap Castle", reputed to be Ireland's most haunted house. You will be greeted by Sean Ryan and his family who will invite you in to their unusual home and Sean, a renowned musician, will tell you the fascinating history of the castle and the part it played in founding the American Constitution. Sean will gladly play a few tunes, with possibly the added bonus of being joined by his talented daughter, who will demonstrate her amazing dancing skills. Dinner on board. This morning we visit the Walled Kitchen Gardens of Portumna Castle and onto Galway City, a lively Anglo-Norman university town and cultural centre of Irish speaking regions in the west of France. Lunch out at an authentic Guinness and oyster bar with time to browse and explore the colourful shops and streets. Return to Shannon Princess and enjoy dinner on board as we cruise to Banager Town on the Co. Offaly shore. Dinner on board. Today we cruise towards the riverside town of Athlone, stopping enroute at Clonmacnoise Ruins a famed 6th century University and early Christian settlement. Continue our cruise north through Europe’s richest example of “callows” landscape. This is one of Ireland’s premier wildflower reserves. Explore at your leisure with time for shopping and antiquing. Dinner on board. This morning we sail north to Lough Ree as we explore some of the 365 islands. We moor at on the beautiful “Inner Lakes” of Lough Ree. After lunch visit a local whiskey distillery. Dating from 1757 the Kilbeggan Distillery is the oldest pot whiskey distillery in world. Dinner on board. This is a sample itinerary and is subject to change. The itinerary is in reverse direction on alternate weeks. **The designated meeting and drop off point is Dublin. Other options are available for charter groups. 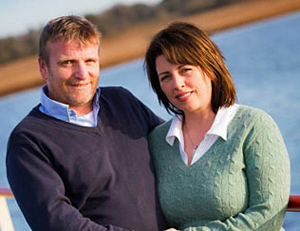 "The warmth and excellent care we received from the captain and crew was the best. Olivia was a miracle worker providing super meals. The barge and crew were excellent with good cabin accommodations, nice excursions and fine route. Everything met my expectations." Lois S.
"The hosts could not have been more helpful or kind. Olivia was the chef and had gone to chef school so the food was out of this world and presented on beautiful place settings. . . The cabins were small but beautifully done up with orchid on the nightstand etc....and they even changed the comforter covers to a different design about half way through the trip--and there were chocolates every night on a little plate....so as you can imagine, this was a very posh trip. The lounge area was lovely and generous with furniture that was very nice. We had a very good time and the group was very compatible so we felt quite lucky. The disadvantage for a walker is that no one could either walk or bike and keep up with the barge--but since there were no walking paths beside the river that would not have been possible anyway. . . Anyone who wants a lovely accommodation and has no desire to walk the paths would find this trip to be great." Joyce L.
**A note to future bargees: Canal cruises are much more conducive to walking and biking than river cruises.